One of the things I find interesting in the world of social media and blogging is that there are people whose number one goal is to get fans, followers and/or subscribers, yet the make it difficult for potential fans, followers and subscribers to connect with them. Let Visitors Choose How to Follow! Sure, you may specifically want Twitter followers, mailing list subscribers, or fans for your Facebook page. But those may not be the routes people want to go when following you. When it comes to giving your visitors options, don’t try to force them to go one way or the other. Instead, give them a nice selection to choose from. This will ensure that you get the visitor to start coming back to your site or blog more often, and probably lead to them following in other ways as well. What Options Do Visitors Want? The following are the most common ways visitors like to continue engagement with you and your website. I would suggest adding these items (in text format, as social icons, or signup forms when applicable) in an easily accessible area site wide, such as the top of your sidebar, header or at the end of your content. RSS – Some may think that subscribing to blogs via RSS using Google Reader or similar sites is going out of style, but it is still an important option to continue displaying on your blog. People such as myself organize everything in Google Reader, for example. Also, the feed link can be used for other applications, such as TwitterFeed, allowing your visitor to share your new posts with their followers via Twitter and Facebook. 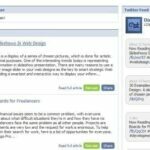 Email (Blog Posts Only) – While you may be sharing your latest blog posts along with other items in your main mailing lists, some people may want to subscribe to your blog posts only when it comes to email. Hence, be sure to give them the option to do so and clearly mark it as blog posts only, that way they know they aren’t inadvertently signing up for the whole shebang. Feedburner, for example, will let you link to the email subscription form or place a text box to capture emails on your website. Email (Your Mailing List) – For those who do want any and all updates you are willing to send, you should have a mailing list signup form not just as a popup, but as an always static form on your site. That way, whenever someone wants to signup, they will have the option. Facebook Fan Page – If your visitors are all about Facebook, then they will naturally want to follow your fan page for the latest updates. Twitter – Be sure to put your Twitter handle in an easy to find spot on your site. People who want to share your blog with others may want to do so with their Twitter following, and nothing is more frustrating than having to leave a site and have to search Google for your Twitter handle. Also be sure that your site uses the Twitter retweet button to share specific pages and content as well. Niche Networks – Depending on your niche, there may be other great sites for your visitors to follow you on as well. For example, on my new photo blog, I give people the option to follow my photography on Flickr. Niches or sites who rely heavily on video may want users to follow them on YouTube. If you’re not sure what networks your niche likes, visit other popular blogs that cover the same topics and see what options they give their visitors. Here are some good examples of sites that give their visitors lots of options to follow them. First of all, take a look at the sidebar here on Stay on Search, which offers the option for posts via RSS or email, Twitter, Facebook, LinkedIn, YouTube, and a mailing list. 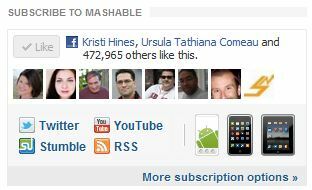 Mashable has the full arsenal of options, including apps for Android, iPhone and iPad. TechCrunch makes their options super simple by including them in the menu bar in the header area, although the minimalist approach may be overlooked by visitors not accustom to looking for those icons. How Do You Get Visitors to Follow You? Do you give your visitors a variety of options to choose from when it comes to following you? Let us know in the comments what those are and what kind of response you see from it.